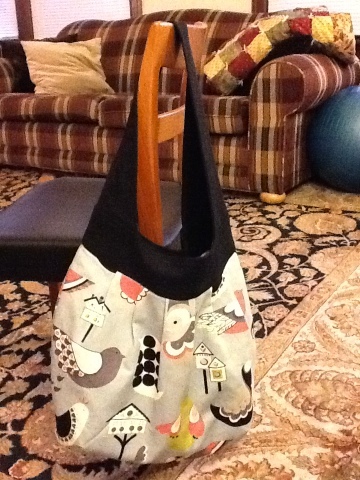 In early 2010 I bought a sewing pattern for a bag (Amy Butler’s Birdie Sling), which I intended to use as a work bag. I finally bought fabric for it in early June when my mom was visiting, which is exactly when I found out that I am pregnant and spent the next 12 weeks feeling horribly ill and tired. Between working and dealing with pregnancy, I just didn’t have the energy or ambition to get started on my bag, so the project sat on my sewing table for several months. Eventually, I started cutting out pattern pieces, but halted when it came time to cut out all the interfacing. It was just a lot of cutting. The Thursday before Christmas was my last day of work and by the end of the next week things had slowed down enough that Bee and I had an entire day at home by ourselves, so I started working on my bag. Once I started sewing I was amazed at how fast it went together. Now I have a finished bag that is the perfect size for toting around baby essentials, though I had not originally intended to use it for that purpose. Hooray for finished sewing projects! That is a great looking bag. I like all the interior pockets (or whatever they are called). Thanks, Laurie! 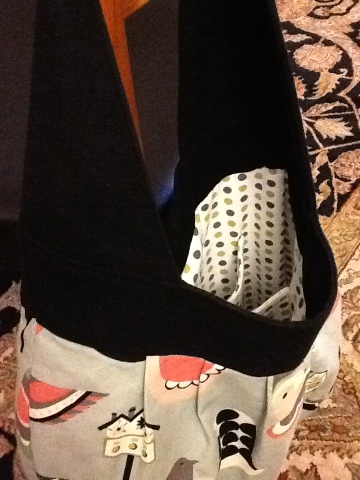 Yes, the pockets on the inside are nice and big – perfect to stash stuff I need to get to quickly. So cute, I love it! Sewing would go so much faster if it didn’t involve all that cutting. It turned out so cute. I’m glad for the choice of fabric. It was perfect!